Adela O’Campo To Yvonne O'Campo Sanchez our thoughts and prayers go out to your famliy. Adela O’Campo May you rest in peace. Adela O’Campo God Bless You..
Adela Ochoa O’Campo was born in Enpalme, Sonora to Guillermo Ochoa and Ramona Moiza on March 22, 1942. She was married to John O’Campo. She worked at Lucky Wishbone for 44 years. Adela is preceded in death by her mother, father, and husband. Adela is survived by her children Yolanda Olivas (husband Edward Olivas), Yvonne Sanchez (husband Peter Sanchez), John O’Campo (wife Alicia O’Campo), grandsons Edward Olivas, Albert Vargas, Antonio Vargas, Daniel O’Campo and great grandson Rey Vargas. The family of Adela wishes to extend our sincere thanks to the caregivers from Comfort Keeper and Prileo (Marisela, Margret, Carmen, and Amber), and Casa del la Luz Hospice. 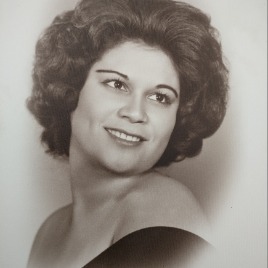 Adela Ochoa O’Campo was born in Enpalme, Sonora to Guillermo Ochoa and Ramona Moiza on March 22, 1942. She was married John O’Campo. She worked at Lucky Wishbone for 44 years. Adela is preceded in death by her mother, father, and husband John O’Campo. Adela is survived by her children Yolanda Olivas (husband Edward Olivas), Yvonne Sanchez (husband Peter Sanchez), John O’Campo (wife Alicia O’Campo), grandsons Edward Olivas, Albert Vargas, Antonio Vargas, and great grandson Rey Vargas. The family of Adela wishes to extend our sincere thanks to the caregivers from Comfort Keeper and Prileo (Marisela, Margret, Carmen, and Amber), and Casa del la Luz Hospice. Please accept my condolences on the passing of Adela O'Campo. May the words found in Acts 24:15 embrace you in comfort during this difficult time in life. YVONNE, YOLIE, AND FAMILY , OUR SINCERE CONDOLENCES ARE WITH ALL OF YOU DURING THIS REALLY DIFFICULT TIME . MAY GOD BLESS ALL OF YOU, ADELA, NOW IS YOUR TIME TO REST IN PEACE. Healgrief has a memorial to share with you. https://healgrief.org/adela-ocampo/ We invite you to express condolences, share special memories and photos and light virtual candles to honor and celebrate the life of our loved one. We also invite you to share this with others who may want to be notified as well. You may do so by sharing the link or by clicking the “Share this Memorial” button from within the memorial itself.